Since at least the year 1220 there have been Irish people leaving St James Gate – home, now, to Guinness – and heading by sea and land to Santiago de Compostela. Of course St James is the English name for San Tiago. I’d left St James’ Hospital a little dejected at having been told that post concussion dizziness and fatigue take on average 43 days to pass if you completely rest the brain or, on average, 100 days if you use your brain (that’s me, I fear, as I don’t know how to switch my brain off), when I saw the sign, pictured below, outside St James’ Church on St James’ Street. There is an office, there, in the church, staffed by volunteers, giving information and documentation for those intending to walk the Camino de Santiago. I decided to drop in and see if any of them wanted to come to the book launch next month (date to be confirmed). A friendly chap there told me that, when excavating to build the Dublin City Council head office on the banks of the River Liffey they found thousands of scallop shells, such as those above that I photographed on the Portuguese way while researching Pins and Needles. According to the guy, it was customary for pilgrims arriving back in Dublin by boat from their Camino to Santiago to throw the shell that they’d carried for the entire trip overboard and this is what led to the huge number of them on what would have been the riverbed. I’d been surprised, when first arriving in Santiago, to find that Galicia is a Celtic culture and that the people there see themselves as being connected to us here in Ireland. It seems that our connection does, indeed, go back through the centuries. To the left hand side of this church front on James Street is the Camino Ireland Office, staffed by volunteers and providing a wealth of information for anyone considering walking the Camino. The pilgrim passport or ‘credencial’ in which you collect stamps from places you stay or eat along the way. This is your proof that you’ve done the walk so that you can get your certificate or ‘compostela’. When people say they have walked or wish to walk ‘the Camino De Santiago’, they usually mean the French route from St Jean Pied de Port in France to Santiago De Compostela in the Spanish province of Galicia – a journey of about 800km or 500 miles. The fact is, though, that ‘the Camino’ is a network of routes that converge at the Cathedral of St James in Santiago. 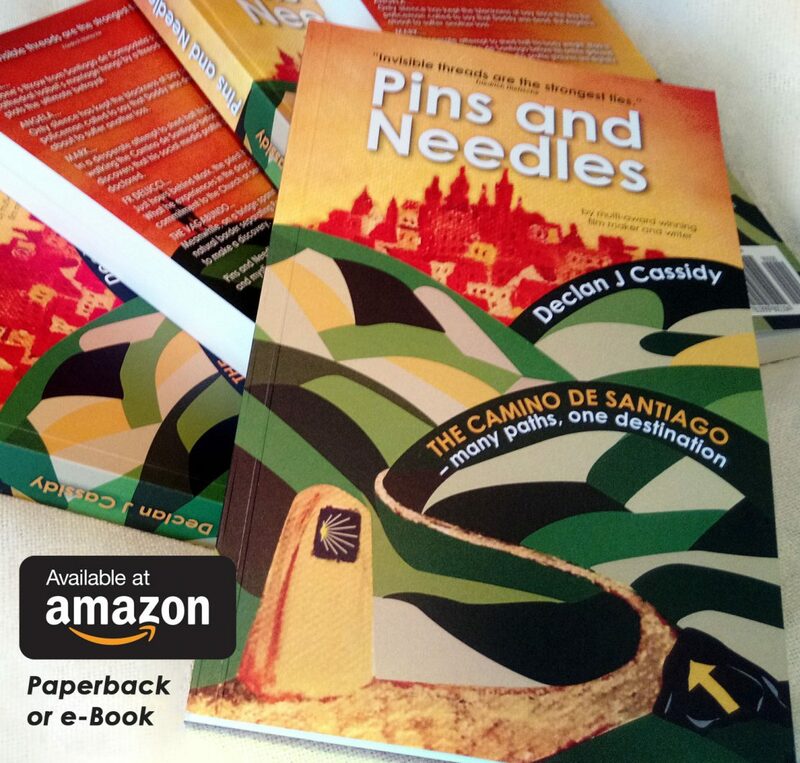 My book, ‘Pins and Needles’, is set on the less popular Portuguese way which starts in Lisbon. Actually, my book is set on just the last 100 kilometres or so. One hundred kilometres is the minimum distance that you must walk abefore you can claim your certificate or ‘compostela’, as they’re called. It’s also an ideal distance to cover if you have a week to get there, do the walk, check out the city of Santiago and get home. I’ve done the final 100km of both the popular French route from Sarria and the Portuguese route from Valença or Tui neighbouring towns across the River Minho – which forms the Spanish/Portuguese border – from each other. For me, the Portuguese way is ideal for this short Camino. I’ve listened to many walkers who have hit the this last stretch of the French way and moaned about the sense of tourism that they are suddenly faced with after weeks of an experience that they found much less commercial. I could see what they meant. The little engraved plates on the milestones that tell you how far you must still walk have pretty much all been stolen by souvenir hunters on the final few days of the French way. Instead, the Portuguese route – which I walked over 10 times in researching ‘Pins and Needles’ – still feels genuine. The signs are still in place. You meet other peregrinos but not in such vast numbers. I’m putting the finishing touches to a free downloadable guide to this ‘one week on the Portuguese way’ that gives general tips on walking the Camino as well as how I recommend the trip to be broken down into five stages. If you subscribe to or keep an eye on this site I expect to have it available within the next couple of weeks. If you want me to send it to you when it’s done, drop me a mail at mail @ screenpublications.com or leave a comment to let me know. By the way, may I add that ‘travelled’, with a double ‘l’ isn’t, as my spellcheck insists, incorrectly spelt. Unlike in the USA, it’s how we spell the word in Ireland and Britain. The seaward side of Ireland’s Eye – a haven for all types of sea birds – pictured from my little Hunter 19 Europa sailboat. I was out sailing my little boat from Howth around Ireland’s Eye and, as often happens when the towering rock face blocks the wind, the sails fell slack and the boat was left bobbing in a sort of micro-doldrums. I sat contemplating the myriad seabirds ensconced in every nook and cranny of the cliff as I waited for the breeze to find the canvas again and set me back on my way. Many times during the writing of Pins and Needles, when I’d been stuck at a plot twist or character development problem, I’d come out here for a sail to clear the mind. Before joining the yacht club at Howth I used to sail from Malahide and I’d just had word that the first bookstore I’d approached – Manor Books in Malahide – had agreed to stock the novel. It set me thinking of the new publishing reality that marries traditional printing, e-books and ‘print on demand’ – in my case through Amazon. The traditional print run of Pins and Needles that is underway at the moment is necessary so that people who decide to get hold of a copy of the book can do so on the same day in a bookstore. However, watching the tiny young seabirds finding their feet on cliff ledges or in the sea around me, it struck me that there’s something rather beautiful about the relatively new world of ‘print on demand’. When I finally signed off on the book it became available to buy through Amazon but didn’t, at that point, exist in physical form anywhere. Each person who then clicked on the ‘purchase button’ to buy a copy was, I realised, actually, breathing life into a physical manifestation of my book. Each purchase meant that the buyer had caused a book to be born, packed and shipped into the world. At various places around Europe now copies of my book have been created in answer to readers’ requests. As they make their way by courier to their new owners they are starting a life that could take them anywhere but they are starting their lives wanted. It’s a pleasant thought for a writer. Keep an eye on this website if you want to know which bookstores are stocking Pins and Needles. We expect the first copies to hit stores around mid September. On the Camino your material world often comes down to what you’ve decided to carry on your back. Make sure that clothing is light and fast-drying. You can layer up for warmth but a thick, soggy article of clothing is something you want to avoid. Be prepared for cold rain and hot sun. Either can happen – and quite possible on the same day. But don’t overdo it. Remember that your raincoat could remain unused and your sun cream might come home unopened. Ten day weather forecasts are pretty accurate so consult them. Don’t bring a large bag. You’ll end up filling it. A smaller backpack forces you to be economical with what you bring. There are shops in towns along the route. If you forget something or find you need it you can buy it. On the other hand, if you bring something you don’t need you’ll be stuck carrying it.